The Tippmann A5, which was designed in 2002, is a semiautomatic .68 caliber paintball marker that can be upgraded to a fully automatic paintball gun quite easily. In this Tippmann A5 review, we are going to take a deeper look into the features of this gun to give you a great overview of the Tippmann A5 so that you can figure out whether this is a good option for your next game of paintball. 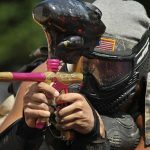 This paintball gun is actually a pretty decent size, which means that that you will have an easier time shooting it, especially with a weight of a little more than three pounds. It is actually only 20 inches long, but the barrel is 8.5 inches, which makes it easier to balance. This is a .68 caliber gun; it has good range, but since the barrel is so short, it does not maintain accuracy after a distance of 150 feet. 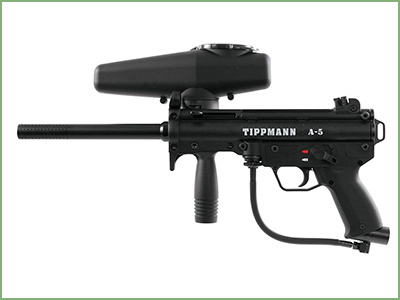 Since the Tippmann A5 has the ability to fire quite a few shots in quick succession, it is a great option for a beginner as well as an intermediate player to use during their game. It has a feed rate of 15 balls each second, but the gun fires a bit slower at about eight shots per second. There is also a 200 round hopper so that you can easily store your balls as you play. 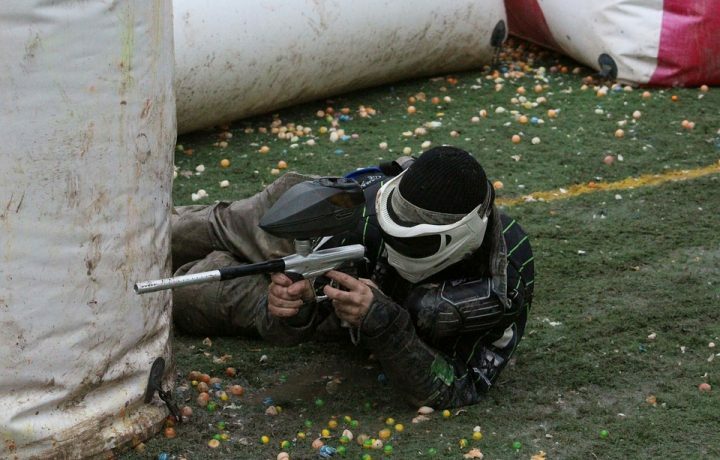 CO2 or compressed air can be used to force the paintballs from the gun, but nitrogen can power the gun as well. In fact, it will require 800 PSI of pressure to give the ball the force that it needs to reach its maximum potential. In the following sections of our Tippmann A5 review, we will be discussing how the Tippmann A5 feels and performs. One of the main considerations that you will need to make when you decide if the Tippmann A5 is right for you is how it feels in your hands. Most of the individuals who have used this paintball gun have stated that the gun is comfortable in their grip. 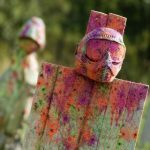 The gun is designed to be easy to use, which is why it is great for those who are just learning to use paintball guns. The large front grip makes it easier to hold, which means that you will have better accuracy when you shoot. In addition, this gun has a long barrel that is designed to help you make more accurate shots while you are playing a game. Since this is a semiautomatic gun, you can expect to go through a round of balls quickly, but luckily, the hopper can hold about 200 rounds at once so that you can keep playing for a long period of time. Insofar as range, this gun can shoot up to 150 feet before it begins to lose accuracy. 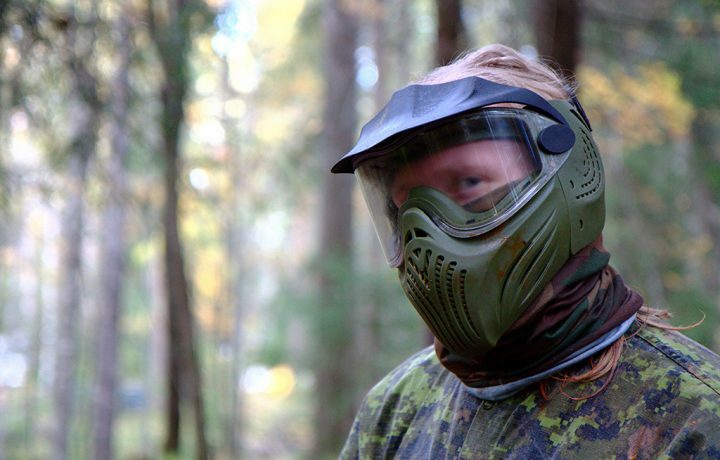 Insofar as the power of this gun, it is actually one of the more powerful options available for paintball. In fact, this model features a Cyclonic Feed system that is designed to link the feeder to the air system. This gives you the ability to fire shots in quick succession with only the trigger. In fact, the system shoots 15 balls per second without the use of batteries. Since this gun has such a powerful shot, it is fitted with a shock absorbing cap that ensures that the recoil of the gun is minimized with each shot. This way you can stay in the game for a longer period of time without missing a single shot. 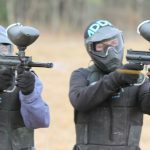 The low recoil and high accuracy of this gun makes it perfect for a beginner who is not yet skilled in the art of paintball; in fact, it is a great way for a novice to learn the rules of paintball without overly worrying about their shot. The Tippmann A5 has a die-cast aluminum receiver that is designed to add more durability to the gun. It is also coated with a durable black finish that will protect it from surface abrasions and scratches. It is a lightweight model because of the aluminum materials, but the durability of the gun is not sacrificed at all due to the construction. When it comes to assembly, you will have an easy time putting the gun together and taking it apart to clean or maintain the gun. Tools are not needed to take the gun apart to oil it, so removing the barrel and lubing all of the moving parts that are contained within the gun should only take a few seconds of your time. In fact, doing this in the field should not take more than 60 seconds. 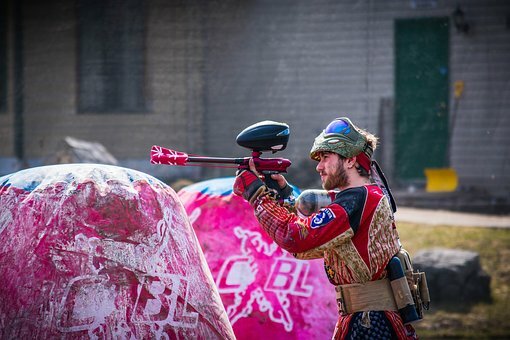 Since this is actually a paintball gun that is designed for less advanced players, the maintenance requirements of the unit are not as excessive as some other models. In fact, as long as you keep it cleaned and oiled, it should remain in working condition for years. This is a great gun that you can upgrade as you learn the skill of paintball. You can upgrade parts to improve your shot and level of accuracy or mod the gun to hold more balls at once. Insofar as the firepower, you can settle for the traditional CO2 operation, but nitrogen and compressed air is also an option that you can choose to upgrade to. You can upgrade the trigger system to a more responsive option if you’d like. This upgrade may not be for some people though; it depends on how smooth the trigger pull feels to you. The barrel is easy to switch out for a sniper barrel if you want to perfect your distance shots as well. You can also find a collapsible stock for more convenient storage or a chamber expansion that allows you to store more balls in your gun at once. You can browse the Tippmann online store to see your options when it comes to Tippmann A5 upgrades. To conclude our Tippmann A5 review, we must say this is a great gun for anyone who is just learning the ins and the outs of paintball. It is a durable unit that is going to last for years, it has a rapid shot ability, and it is very easy to upgrade, which means that you can still use the gun as your skills improve. One of the reasons that this is a great option for a beginner is the lack of recoil that you experience with this gun. This means that someone who is not used to shooting will be able to maintain their accuracy during a game. 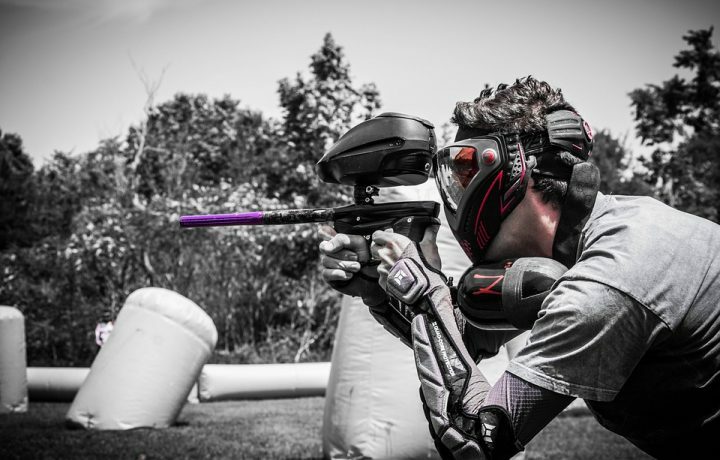 We believe the Tippmann A5 is one of the best sniper paintball guns on the market. What do you think? Did you find out Tippmann A5 review useful? Let us know in the comments!